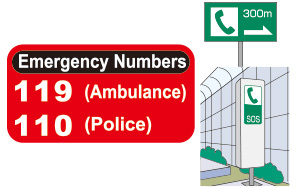 Emergencies on the Expressway - West Nippon Expressway Company Limited. Saving lives and ensuring safety take first priority. Call an ambulance if someone gets sick or is injured in an accident. Call police or rental car agencies after the injured party has been taken care of. If you don’t speak Japanese, ask a Japanese person nearby to call for help. There are emergency phones installed at the roadside at one kilometer intervals on the expressway. Use your kilopost number as a reference for your location when calling for help in an emergency.